Vasantabalan surely deserves applause for such a brave attempt, trying to give a different experience, by adding interesting elements right from the title of the film. It is indeed a film with amazing efforts from all technicians, artists and excessive research, but whether all those valuable efforts have satisfied the intention or not, is the question. The film is about the life of stage drama artists of Tamil Nadu in the early 20th century. Siddarth and Prithviraj Sukumaran are two senior students of a ‘drama company’. One of them is a genius while the other one is jealous. The jealous man’s actions put the company into unimaginable circumstances- the chain reaction of events that follow forms the rest of Kaaviya Thalaivan. Prithviraj and Nirav Shah- it is difficult to choose just one of those names. In fact, the film has equally amazing works from technicians in other departments too, the only difference being that those technicians have flawed at least once in the movie. Prithviraj and Nirav Shah are the only artists with 100% perfection in the film. Prithviraj- this guy knows how to create and shape a character with expressions and even minute details to eye movements. It feels like interacting with a real drama actor from the past. The tinge of jealousy and pride in Prithviraj’s eyes creates a ripple-effect striking our conscience. Prithvi’s part in this movie is a rulebook for beginners to learn to shape a character. Nirav Shah’s cinematography in Kaaviya Thalaivan can be rated as one of the very few perfect works in Tamil cinema for the year 2014. It has been a long time since we saw such ‘uniform lighting’ for the full length of a movie- cinematographers and directors concentrating on such uncompromised visual quality are becoming rare. Nirav’s previous near-perfect work was wasted in A.L.Vijay’s Saivam, thankfully this time he has got a better platform. He has also avoided the audience getting the feeling of watching a reality show, since most of the scenes in the film happen inside a tent/shed where the plays are held. So far it is so good, technically. When it comes to using the camera to convey the mood of a scene, the psychology of the characters and the emotions intended, Nirav Shah has not really done a great part- he could use that camera a bit more give to an artistic experience to the audience. He might also avoid using some artificially exaggerated frames in such serious films. After Nirav and Prithvi it is the music and art direction that add appeal to the film, not to forget the costumes. Rahman’s songs are very lively. The background music is soothing and traditional without much western influence. The song ‘Sandi Kudhira’ made in a ‘Rock & Roll’ style overflows with energy- the lyrics, Haricharan’s voice, Siddharth’s dance, the music- everything! All other songs are mesmerizing, placed at apt positions- except for the one duet in the second half that could’ve been avoided. The song ‘Alli Arjuna’ spanning for nearly 10 minutes (lyrics by the late poet Vaali) takes us in a joyride to a magical world. Praveen.K.L has made it a more serene and calm film- a few touches here and there perfectly gel with the vintage feel of the film. The sequences in Malaysia, Singapore, and Colombo after the intermission could’ve been more logically paced- 5 years pass in just under 5 minutes. It is a clichéd technique and could’ve been done in an innovative way. The art, properties and costumes form the core of a period film. Of those, art direction is a long, tedious process. It is true the technicians have worked so hard to create the feel and tone of a period film, but there are mistakes that could be easily spotted every three scenes. Mistakes may be present but not as distracting and prominent as in this film, eventually breaking the reliability of the period film. In quite a lot of scenes you keep wondering about the ‘fabric’ worn by some atmosphere artists- especially the one woman who wears a modern saree in the riots burning foreign clothes. You can classify films into two categories- the ones that narrate a story and the ones that do not have a story but give you an ‘experience’. 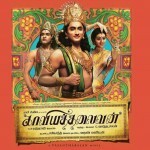 For the first one hour, Kaaviya Thalaivan does look like one belonging to the latter type of films. Though scenes go predictable, you just don’t see that as a problem and only concentrate more on the film experience and visual aesthetics. However, there are some drastic, swift turns in the second half and the film becomes a ‘story-teller’. In that case, predictability becomes a staggering problem. For example, when Prithviraj falls ill the assistants search for a substitute to play the part for the day. You can easily guess they are going to bring in Siddharth, the moment Prithviraj calls for a substitute. But the scene keeps rolling on and on- someone comes and says he has found a man, he promises to bring a better actor for the next day, Prithviraj then orders the substitute to come in, and then he slowly comes in and appears out of a ‘silhouette’. Why such useless buildup of tension? Such scenes spoil the ‘realistic’ feel of the film. The wonderful ‘film experience’ of the first half is definitely missing in the second. Almost everything seems to fall apart in the second half- even Rahman’s music becomes clichéd and monotonous. Using Veena and Sitar in emotional scenes, heavy ‘Shehnai’ in the climax- we have seen those a hundred times, Mr.Rahman. Even if you had left those scenes in silence, with no BGM at all, it would’ve had an impact. The film becomes so ‘fake’ in the second half. The visualization becomes way too ordinary. Note- it is not dramatic, but it is cinematic. If the film had been dramatic, it would’ve been a nice effort to recreate the drama era. The only two artists who have not slipped in the second half are Nirav Shah and Prithviraj. All others have become pointless in the second half. Up next, problems that exist throughout the movie. First of all those, dialogues. When you see such miserable, immature dialogues, you doubt whether you read the words right in the titles- “Sambashanai- Jeyamohan”. Is he the same guy who wrote raw and rustic dialogues for “Nan Kadavul”? In fact, such a film needs ‘conversations’, not dialogues. Those ‘template’ dialogues never let us feel closer to the film. Secondly, Siddharth. He looks misfit for such a deep and mature character- the whole film indeed revolves around him. Siddharth only looks like a flirty young boy going around town with no good intention. His naughty face and childish pronunciation of Tamil do not go well with the character he plays- Kaliappa Bagavathar. On the other hand, all characters in the film praise him heavily for the genius he is. Only we feel lonely in the cinema hall while Nassar, Vedhika, the princess and every other character feels moved by Siddharth’s performance. When Nassar calls Siddharth and Prithviraj to showcase their talents, we immediately guess it is Siddharth who’s going to be selected. But Siddharth’s performance is not something that pleases us before Nassar makes the call. Siddharth shines well only in the ‘cursing’ scenes. Overall he is a very wrong choice. The above mentioned scene is just one example. Throughout the film there is no proper justification for many other concepts. Siddharth criticizes Vedhika’s talents at one point, he praises her later. However, Vedhika’s performance just constantly remains good throughout the film. Only the characters speak such dialogues but we are never able to feel the heat of the situation ourselves. The company tours various places to stage their places throughout the film, but all the stages look exactly alike. We do not get the real feeling of getting into a drama tent at any point. The tent/shed is just shown once from outside as an establishment, and then the audience inside, just like showing dolls at a supermarket. The film at no point speaks about the life and activities of a drama company. It doesn’t necessarily mean that separate scenes must be included for that. Those things can be added as details just as the film progresses, without the audience even noticing it. The practice, verses, rehearsals, taking a bath at the river- all these are shown just for a formality in the beginning and then the film proceeds with importance only to Siddharth, Prithviraj, Nassar and Vedhika. The other actors in the company do not even utter a word in the film. Singam puli and Thambi Ramiah just talk something funny or emotional once in a while. Nassar, who is shown to be a strict master, one who has high respect for the art is just seen to be present nowhere while Siddharth does some wonderful western dance teasing the princess, in the “Sandi Kudhirai” song. There is a series in the Sunday special supplement of the Dinamalar newspaper ‘Varamalar’, about the life of the genius Shivaji Ganesan in his childhood, in a drama company. It does not have great writing, but when you read it you get a clear picture of how a drama company would’ve functioned in the olden days, and its day-to-day activities. In that case, it could’ve been portrayed in a stronger way in a visual medium. After all the film is an effort to recreate the ‘drama era’. Minus this concept of drama company, it is just another commercial Tamil film. The climax is totally, unbelievably clichéd. The last scene after this ‘epic’ climax has a nice symbolism. The greatest problem of all these that breaks the believability factor in the film is its sounds. In a period that not even had electricity, it would’ve been good to portray the real sounds of the actors raising their voice, the sound of musical instruments inside a tent and so on. But all these are rendered with ‘digital clarity’. When Prithviraj and Siddharth whisper at the side of the stage while the play is going on, their voices are loud and clear with a ‘DTS quality’. The film would’ve easily got the ‘reality factor’ right if just the raw sounds were made. In a film that speaks about stage drama actors, all the actors have played their parts brilliantly. It is very rare to see all actors perform well in a film. We could feel a slight resemblance to the film “The Prestige” right from the beginning. Even if it was true that Vasantabalan was inspired by the film, he deserves credit for adding a lot more details and making it a totally different film. There is only a mild resemblance. Though all the technicians have put in their most sincere efforts and abilities, Vasantabalan has not successfully converted those into one good film. On the whole, we are never able to empathize with the feelings in the film. Ironically, Vasantabalan is a director who made films like ‘Veyil’ that struck the right emotions very well. Who can forget the scene in ‘Veyil’ when Pasupathi meets his brother after several years in a teashop? How does even the basic realism fail in such a director’s film? Where does the pretense appear? It is not a regular commercial-masala film. On the other hand, it is not a perfect artistic film either. It only stays in our mind as a half-baked film. However, minus some ‘template’ visualization in the second half, it is a good effort, a good film. With such abundant resources and talented technicians, it only turns out to be a ‘watchable’ film, rather than becoming a “world class epic”.